How to Apply Polyurethane, Oil-based Polyurethane Wood Finish — When you need an extra tough finish that is chemically resistant polyurethane is a good choice. The strengths of polyurethanes are the high build properties allowing for a minimal number of coats, and good toughness. Polyurethane’s weaknesses are the slow dry (the “fast dry” polyurethanes take about 4 – 6 hours to dry), yellowing and adhesion problems to some substrates. Polyurethanes don’t water-spot (white rings) like shellac and lacquer, they are therefore, good for table tops where there might be liquid spills. Oil based polyurethanes are oil modified urethanes. Most oil urethanes will yellow with time, so they should not be used as a clear coat over your faux finish, or over white washed / pickled wood stains. Yellowing is usually not an issue with most stain colors, you really don’t notice that it is occurring over darker stained wood. Minwax polyurethane comes in gloss, semi-gloss and satin sheens. I use the satin sheen often, it seems to be the customer’s favorite sheen level. You can get a pretty good finish with two coats of polyurethane. A better finish is achieved with three. You may apply polyurethane directly over wood stain or you can speed the job up by applying a suitable sealer first, then applying two coats of polyurethane. Because polyurethane dries so slowly, a quick drying seal coat will speed up the progress of the job. You don’t have to use a sealer, you can apply a coat of polyurethane each day – over a period of two or three days – if you have the time for that. For many professionals, time is of the essence, and sealing with a fast dry sealer is the way to go. In fact, most pros would probably put on two coats of fast dry sealer, then one final coat of slow drying urethane for the final finish. Be careful what you put polyurethane over. Polyurethane has poor adhesion to some finishes. Regular shellac, whether it is clear or orange, contains some natural wax that will repel the polyurethane and case it to flake off and peel. A good universal sealer is Zinsser’s Seal Coat, which is a de-waxed shellac, works well under polyurethane. Seal Coat dries fast, and will not lift or pull the color out of an oil based stain. You can put the polyurethane on with a brush or spray. You can even roll it on with a clean, short nap roller cover on large surfaces like flush doors or paneling. Don’t shake clear finishes, especially thick clear finishes, because it will introduce air into the material. 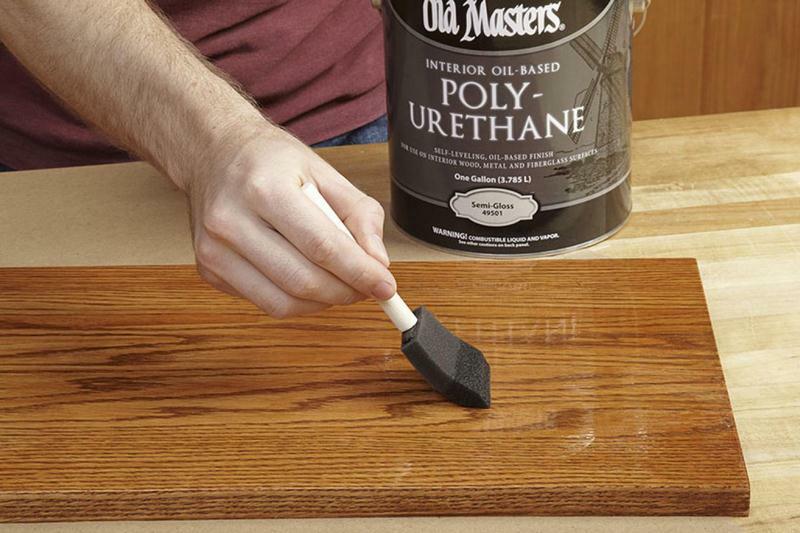 Stir the polyurethane instead with a paint stir stick, prior to using. Be sure to mix the settled flatner on the bottom of the can, or your satin with not be “satin” when it is applied. Polyurethane was made for brushing. It is a pleasure to brush. Lay it on, lay it off and leave it. Don’t over brush or you will have sheen problems. F you back brush into semi dry polyurethane, it will look flat (sheen) where you did the back brushing. Put it on, get it right and move on. Stiff finishes, like polyurethane go on better with a black china bristle brush. Softer bristled brushes won’t spread the material (as it comes out of the can) very well.You can thin it a bit if needed, for better brushing, but you will reduce the film build and increase the number of coats needed. You will need to thin the material for spraying. Use mineral spirits, and run the polyurethane through a strainer as you pour it into your cup gun. Use an HVLP sprayer, and wear a respirator during the spraying process. There are better spraying finishes than polyurethane. Shellac, lacquer and even oil based varnish all spray better. The strength of polyurethane is it’s high build. Put it on with a brush, you will get a pretty decent finish, in a minimum number of coats. Other finishes will both, spray and rub out better than polyurethane. You can actually apply polyurethane with a clean, short nap roller. You must follow that up with a “tipping off” using light brush strokes in the direction of the wood grain to remove any air bubbles and stipple. A used short nap roller will work better than a new one because it will shed less (hopefully, not at all). Any roller lint will show up in a clear finish, so be careful when rolling. Because polyurethane is a bit finicky, and will not adhere to some clear finishes that contain wax or sterates, you are better off using an oil varnish rather than polyurethane over old clear coats. If you really need the extra toughness and water resistance of polyurethane, apply a coat of Zinsser’s Seal Coat first, then apply the polyurethane as a final finish. When going over an old finish, always clean the old surface – squeaky clean. Remove any traces of furniture polish and wax etc… then sand the surface, before applying any polyurethane. If your house was built prior to 1978, you should skip the sanding , but you MUST be sure the surface is absolutely clean. Then use the Seal Coat, which has good adhesion to most surfaces, even glossy clear coats, providing they are clean.